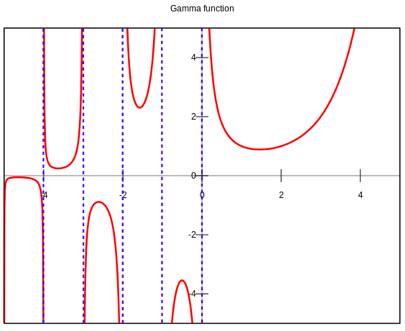 Editor’s Note: This submission by Isaac E. ('14) is an article introducing and describing the gamma function. This is a description of how the great, grandiose, gamma function works, not why. An explanation of why it works requires a level of mathematical understanding that I in my current state have not yet achieve. If I may offer my input: I recommend that you read this article because it is a cool idea to think about regardless of whether or not you actually end up understanding why it can do what it does. Have you ever seen a number with an exclamation point next to it (e.g. 5!)? Chances are you have and you will know that that means you are taking that number’s factorial. If you haven’t, a numbers factorial is that number multiplied by every integer preceding it all the way to 1. For instance, 2! = 2 * 1 = 2, 3! = 3 * 2 * 1 = 6, 5! = 5 * 4 * 3 * 2 * 1 = 120, and so on. There are three things you should observe from taking a number’s (denoted by “n”) factorial: the first being that n! becomes very large very quickly, the second is that n! can only be taken for whole numbers (called integers), and the third is that every number on a graph of n! is a discrete point (i.e. they are not connected by a smooth curve). The Gamma Function creates a curve which connects all of the discrete points of (n-1)! to create a smooth curve. This strange piece of mathemagic will be elucidated shortly, but let us first conceptualize the beauty of a function which can connect points we usually think of as simply being pretty much independent of one another. If you haven’t taken calculus, or even if you have taken calculus, a billion red lights must be going off in your head right now. What is this elongated curly-cue with a zero at the bottom and an infinity sign at the top? And, why are there two variables (x and t)? must be some of the questions you are asking right now. All will be explained. The first thing you should understand is that the curly-cue thing is called an “integrand.” It basically tells you to find the area under the function located to its right (learning the calculus will allow you to perform this awesome feat). The second thing is that for some functions which are asymptotic at zero, the area under the curve approaches a finite value. In this case, the finite value is Γ(t), but more on that later. 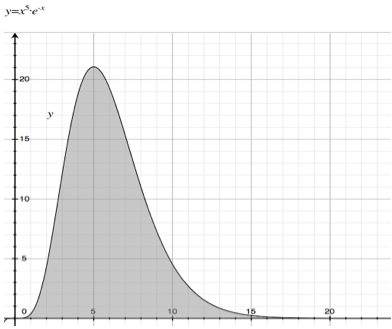 Once the t input values of Γ(t) become negative the graph has a lot of asymptotic behavior that can be further analyzed by using understanding how to manipulate the integral. 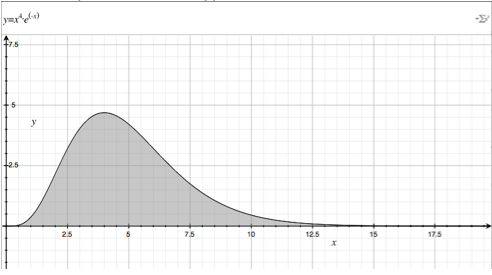 The main point of the gamma function though, is to illustrate to you that there are ways of combining the factorial values in a smooth curve. Although this is somewhat of a superficial understanding, I invite you as a reader to explore the idea of the gamma function more deeply.